Well, you might be the only one who sees it I've looked through some of your pictures and haven't noticed any particular resemblances myself, but then, Middle Earth is in the Eye of the Beholder, isn't it? If YOU see it, shouldn't that be enough for you? Tol Morwen, Tol Fuin and Himling, the remnant islands of Beleriand that survived the War of Wrath, look very much like Ibiza, Mallorca and Menorca (the Balearic Islands) to me. Lindon, The Grey Havens and the Lune River Valley (now under the Alboran Sea) could be situated around what we now call the Strait of Gibraltar. The Atlas Mountains of Morocco stand, roughly, where the Misty Mountains should be. The rest of Spain and Portugal are a good match for the lands northwest of Beleriand. This would be Hithlum and its surrounding areas. Angband would be somewhere in the Pyrenees north of the Balearic Islands (possibly the volcanic region southeast of Andorra). Mordor would be located in the Anti-Atlas range of southwestern Morocco. Rhun would be eastward in the direction of Algeria. Last edited by MoroccoTheory on Sat Sep 26, 2015 11:06 am, edited 1 time in total. scirocco wrote: changes over the time could explain all the things wrong with your theory, like Tazekka National Park to Agadir being only about half the distance from Rivendell to Minas Tirith, and in quite a different direction. Obviously the land got squashed up. The change in direction is a real issue. The Balearic islands seem to have shifted even further from Gibraltar (my guess for the Gulf of Lune and Grey Havens) and rotated to their present position. 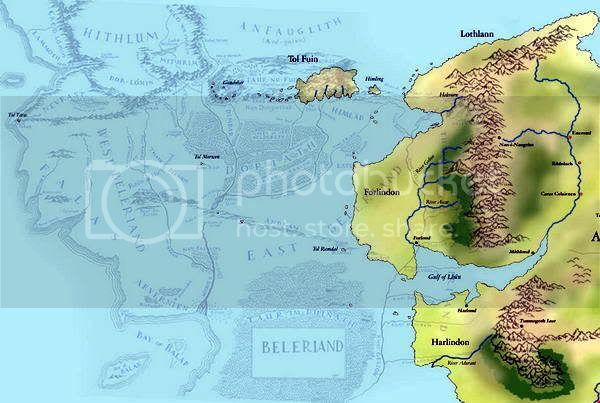 Compare with how the remnant islands of Beleriand are situated with respect to Lindon and the Grey Havens. I'm not sure how how this map was made. I don't think Tolkien made it himself, so the directions could be off to one degree or another. Last edited by MoroccoTheory on Mon May 02, 2016 12:31 pm, edited 1 time in total. The Berber people seem to have inhabited Morocco and much of Northwest Africa since Pre-Phoenician times. Does anyone know where the Berbers came from. They may have Nordic roots. I read that Berber Moroccans could be related to the Sami people of Scandinavia. I'm just wondering if I'm the only one that notices the similarity. No need to wonder. You are the only one. Imagine Spain covered with water and ice, then shift the Balearic Islands westward and rotate them in your mind. I put Numenor somewhere in or around the Azores. Shifting the Balearic Islands and covering Spain with water and ice involves some major geologic activity. This pushes Tolkien's story further back in geologic prehistory long before the Phoenicians reached Morocco. Mainland Spain (north and west of Beleriand) was never under water. It just shifted in position along with the Balearic Islands (northern Beleriand). Last edited by MoroccoTheory on Sat Sep 26, 2015 10:59 am, edited 2 times in total. I'm not a geologist, but The Messinian Salinity crisis during the Miocene epoch fits intuitively with karst topography and the vast networks of caves in Tolkien's stories. This is the time period when the Balearic Islands may have shifted and the Zanclean flood reopened the straits of Gibraltar. The Zanclean flood could have washed out the Lune River Valley sometime after the War of the Ring, letting the Atlantic Ocean drain back into the western Med basin and the Ice Bay of Forochel. An earlier relative of Argentavis magnificens, a giant south american condor from the late Miocene epoch, could have crossed over to Morocco and played the role of the eagles in Tolkien's books. My geology is just intuitive guesswork. I'm not an expert. The Balearic Islands, possible remnant islands of Beleriand, wouldn't shift eastward until after the War of the Ring. So my guesswork sets the War of the Ring sometime before the Messinian salinity crisis, and long before the Zanclean flood. If you imagine a great rift opening from the Gulf of Cadiz along a straight line that runs just north of the Balearic Islands, you don't even need to shift the three islands from their present day position. You don't need to rotate them either. This would mean that the eastern and western parts of Beleriand got deformed to one degree or another ["The shape of all lands has changed."] and transformed into Middle Earth by the time of the War of the Ring. Deformed parts of Beleriand would become Morocco and Algeria (Middle Earth and Rhun). This puts Doriath under the Med Sea just south of the Balearic Islands. Parts of southern Doriath could still exist on the north coast of Algeria. Hithlum and surrounding areas that somehow managed to survive the War of Wrath would become mainland Spain and Portugal. I place the Firth of Drengist near the Gulf of Cadiz in southwestern Spain. Last edited by MoroccoTheory on Wed Dec 02, 2015 7:10 am, edited 3 times in total. I think this map is in error. Middle Earth is shifted much too far eastward. Corsica and Sardinia would form a big mountain range running north to south on the right hand side of this map if you empty the water from the Western Med basin. The Blue Mountains should be in the area of West Beleriand that was deformed/transformed into Middle Earth in the years after the War of Wrath. Cirdan's stronghold in the area of Falas in West Beleriand should be in the same area as Lindon, the Blue Mountains and The Gray Havens many years after the destruction of Beleriand. I put the Great Sea of Belegaer on the Atlantic side of Gibraltar (the area of Lindon and The Blue Mountains) and place the Sea of Helcar somewhere in the Mediterranean east of the Balearic Islands (possibly in the same area as the Ice Bay of Forochel or even further east). There could be some confusion here about the identity of The Blue Mountains. The Ered Luin which I put along the southeast coast of Spain beside Gibraltar and north of the Lune River, may or may not be the Blue Mountains. These may not be the same Blue Mountains shown on the far east side of Beleriand before the War of Wrath. Corsica and Sardinia (Cape of Forochel?) could form the other end of the Blue Mountains. The original Blue Mountains, before the War of Wrath, may have formed one long chain running from southern Spain past the Balearics and on to Sardinia and Corsica. You may still need to shift the Balearic Islands during the War of Wrath and break the line of the Blue Mountains to get the present day positions. Alternatively, you could shift Africa and Gibraltar up against southern Spain. I'm still not sure about this. Last edited by MoroccoTheory on Wed Dec 02, 2015 8:47 am, edited 10 times in total. I think that whole area just west of Gibraltar was Cirdan's home in the Falas in West Beleriand. Then the War of Wrath destroyed the area. Parts of the land may have sunk or deformed and arose from the sea again. Many of Cirdan's mariners survived and returned to form the Grey Havens near the Ered Luin. "The shape of all lands has changed." Parts of southern Spain were still underwater and you might be able to sail around past Gibraltar (Tol Morwen?) to the other remnant islands of north central Beleriand...the Balearic Islands. Then the War of the Ring came and went. Spain (once called Hithlum) was convulsed by some geological event (possibly related to the Messinian Salinity crisis) and rose again from the sea to seal tight the passage from the Atlantic to Med Sea. Many years later some catastrophic event similar to the "Zanclean Flood" washed out the Lune River valley (now the Alboran Sea), reconnecting the Atlantic Ocean with the Med Sea, and leaving the lands of Lindon standing on either side of the straight of Gibraltar. Spain (area of Hithlum) remains to the present day. The Balearic Islands, the remnant islands of northern Beleriand that survived the War of Wrath, remain to the present day. Gibraltar remains. Corsica and Sardinia form the big mountain chain on the far eastern side of those Beleriand maps. The Inland Sea of Helcar is further east (possibly a smaller precursor to the Tyrrhenian Sea). After the War of Wrath, the Cape of Forochel and Ice Bay remain in this region, but the Inland Sea of Helcar may have been even further away on the far eastern side of the Mediterranean. The ruins of Doriath, if anything remains at all, would be under the waters of the Med Sea just south of the Balearic Islands. You might find the ruins of Gondolin somewhere around Mallorca above or beneath the sea or even further west closer to Ibiza. Angband might still exist beneath the Pyrenees. My guess is the volcanic region just southeast of Andorra. Morocco (the reshaped lands of West Beleriand that became Middle Earth) remains to the present day along with Algeria (the reshaped lands of East Beleriand in the area of Rhun). The ruins of Nargothrond could be somewhere in northern Morocco, probably in the same area as Angmar and Fornost northwest of Rivendell. Tazekka National Park in Morocco is still my choice for Rivendell. If anything remains of the Gates of Sirion, you should find it far to the southwest of the Balearic Islands (and sunken Doriath) somewhere near the Moroccan/Algerian border region. These Gates may have been closer to Rivendell and the Lonely Mountain than anything else. The Lonely Mountain in the Hobbit also had a river running out its front gate. Last edited by MoroccoTheory on Fri Oct 02, 2015 11:10 am, edited 9 times in total. Peter Jackson obviously thought much of New Zealand looks like Middle Earth ... and I agree! What breath-taking natural beauty is there. It's timeless beauty does evoke another time, where imagination and fantasy are The Order of the Day! But woods, almost anywhere, could almost serve as The Old Forest, could they not? Sometimes, when I see the early-morning light piercing through the leaves and branches, illuminating the mist that's about, it makes me wonder why I don't believe in Magic. It just struck me that the rock of Gibraltar could be Tol Morwen. Tol Morwen was located a great distance further southwest of Tol Fuin and Himmling. This would mean that The Balearic Islands only represent two of the three remnant islands of Beleriand. Ibiza and Mallorca can be combined to form Tol Fuin and the lesser islands just to the west. Last edited by MoroccoTheory on Wed Dec 02, 2015 5:56 am, edited 1 time in total. Tolkien doesn't show Tol Morwen on any of his maps. My guess is that this remnant of Beleriand is hiding in plain sight (Gibraltar) on the north side of the Lune River not far from the Grey Havens. Following the Ered Luin along the north side of the Lune River valley (now the southeast coast of Spain) you should eventually reach open water and then sight Tol Fuin and Himmling (now the Balearic Islands). I'm getting more and more convinced that Gibraltar is a good match for Tol Morwen. I think the ruins of Gondolin could be underwater somewhere between (or just east of) Ibiza and Formentera. The other Balearics are Tol Fuin and Himmling. The River Sirion may once have flowed southwards between Ibiza and the modern coastline of Spain. The entrance to Angband is just to the north beneath the southern slopes of the Pyrenees. Last edited by MoroccoTheory on Tue Dec 08, 2015 7:30 am, edited 1 time in total. Ibiza and Formentera are all that remain of the Encircling Mountains around Gondolin. The Hidden Pass and its seven gates could be beneath the channel that separates these islands. Does anyone have any new thoughts on this theory? The Neanderthals of Gibraltar (Tol Morwen?) may have been connected in some way to Tolkien's story. I just found these maps showing Tol Fuin and Himling. Gibraltar, my guess for Tol Morwen, would be located closer to Mt Dolmed and the Grey Havens on these maps. Jules Verne's 1877 story Off on a Comet started in the area of Gibraltar and Formentera, and later ended near Mostaganem in Algeria. This is the same area as this Atlas Mountains theory. Last edited by MoroccoTheory on Sun Mar 19, 2017 2:13 pm, edited 1 time in total. In Jules Verne's 1870 story 20,000 Leagues Under the Sea, I think Captain Nemo looked at the ruins of Atlantis near the Azores. This is my best guess for the ruins of Numenor in this Tolkien theory. Tolkien did say that Numenor is not Atlantis, but I still think both may have been in the same general area around the Azores. Any new comments on this theory? I still think the mountain called Narguechoum in northeastern Morocco is good candidate for the lonely mountain, but this is just guesswork. Or the whole thing could be a dead end to keep people marching in circles until judgement day. The ruins of Gondolin would be near Ibiza and Formentera in the western Balearics with the hidden entrance directly between the islands. These islands are the remnant islands of Beleriand (Tol Fuin and Himmling). Numenor and Atlantis would be near the Azores or even further west. Gibraltar is still my choice for Tol Morwen.